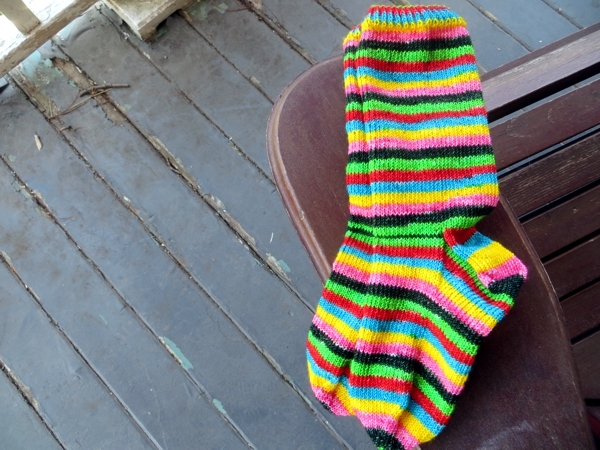 I was a few days into writing every spare minute when I suddenly noticed I'd tossed this sock in progress next to my computer, on top of its mate which I had finished off when I was supposed to be working on a difficult chapter. It's pretty and colourful and so not what you should have next to your computer when you're trying to focus on work. 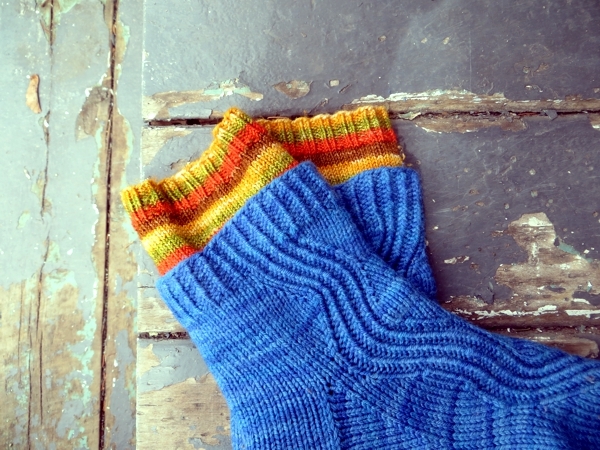 The next day I had to stop writing again to take another picture of the sock. Just try ignoring these stripes, I dare you. 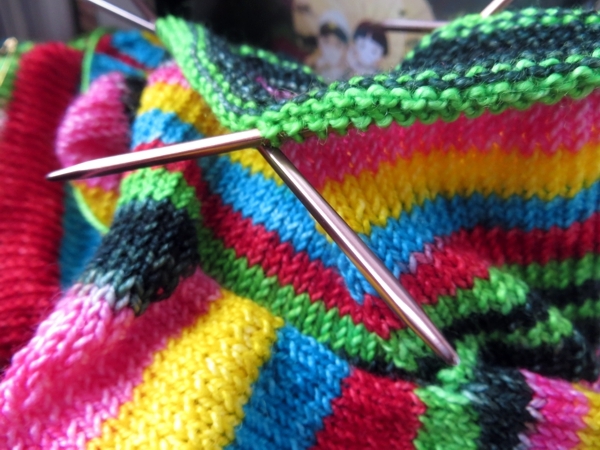 It's farther along here because - yep, I caved in and knit it. In fact I nearly finished it the day after that, but I decided to get some sleep instead. ... and thought Wow, those are some nice colours, aren't they. 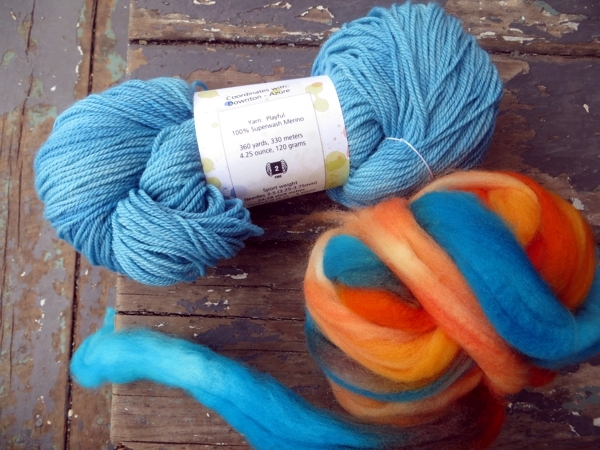 Even though the shades aren't perfect, if there's any left of the Aqua yarn after I make socks with it, it might look really awesome striped with handspun Moxie. I don't know about you but I am noticing a theme here and it's not just that I seem to be procrastinating a lot. There's some serious blue and yellow and orange going on in my house right now! 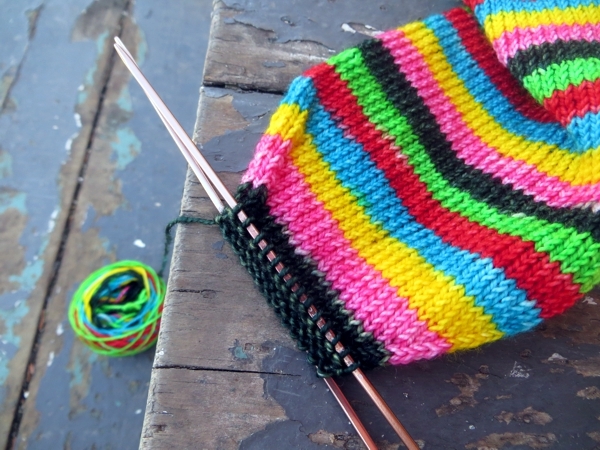 There are some aspects of writing that are very, very similar to knitting. Any of this ring a bell for you? 1/ OH NO I can't do this I am terrible and hopeless and I should just give up! 2/ OH NO my leg is asleep again! 3/ OH NO this just does. not. work! The first one is the worst, and you absolutely have to ignore it and push through. The best solution is to remember that you can be not nearly good enough and still be a lot better than a nearby lamp, or maybe even your next-door-neighbour who is just learning to crawl. Fortunately I did start those other stripies at the beginning of all this writing mania, so I have something to fall back on. But not literally. That would be ouch. Meanwhile: the Twitter experiment continues tomorrow. Haiku Tuesdays, Very Short Story Thursdays. 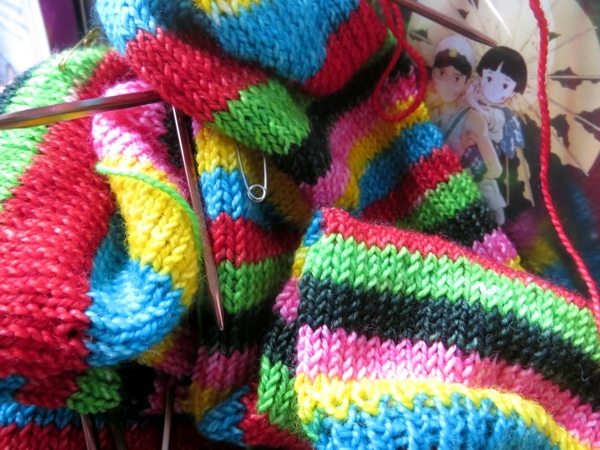 Hope you see something you like on one of them and I'll be back on Wednesday with some more pretty, finished knits! such beauty is difficult to ignore!